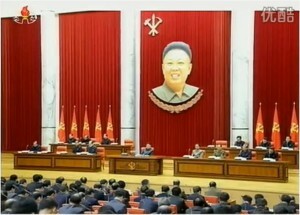 The downfall of Jang Song Thaek is the most significant political event in the history of post-Kim Jong Il North Korea. 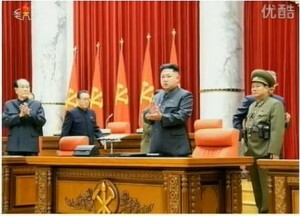 The removal of “Jang and his group” for “the anti-party, counter-revolutionary factional acts” is the second major adjustment in North Korea’s power configuration under Kim Jong Un’s leadership, eclipsing in significance the ouster of Kim’s primary guardian former Chief of General Staff Vice-Marshal Ri Yong Ho in July 2012, who had suffered a much milder punishment by comparison. It confirms my earlier assessment that the young marshal was going to use Jang for as long as he had to, but then would cut him off just like his father had purged his uncle Kim Yong Ju when Kim Jong Il deemed him as a threat to his own power bid in the mid-1970s. Jang’s sacking contributes to the cumulative evidence that the maturing leader continues to dismiss his elder guardians appointed by his father in order to clear the path for his own absolute rule. Obviously, Kim Jong Un has already become powerful enough to exercise full control as his father had planned. …[T]he party served warning to Jang several times and dealt blows at him, watching his group’s anti-party, counter-revolutionary factional acts as it has been aware of them from long ago. But Jang did not pay heed to it but went beyond tolerance limit. That was why the party eliminated Jang and purged his group. Reportedly, Korean People’s Army (KPA) Defense Security Command arrested and executed Jang’s deputies Ri Ryong Ha and Chang Su Kil on November 12, probably put Jang under house arrest on November 18 and moved him to a special detention facility on November 30. Then the regime staged a show of publicly arresting him again in front of all senior party officials at the Politburo meeting on December 8. The footage of Jang’s public arrest aired on Korean central television the next day was probably meant to show that Jang had no support in the party and that Kim Jong Un fully controlled the situation without fear of any resistance from the senior cadres in attendance. In early December, Jang’s name was deleted from DPRK official media websites and his images were redacted from numerous documentaries about Kim Jong Un’s activities. The evidence indicating that Jang was losing his grip on power has been accumulating since late last year, but foreign observers simply did not pay attention because of the dominant belief that he was the éminence grise behind Kim Jong Un’s throne. In hindsight, some of the unusual developments around Jang which seemed odd at the time but were discounted because of his presumed omni-powerful status now reflect on the grey cardinal in a new less flattering light and may offer clues to his mounting troubles. Three abnormal events stand out. First, in November 2012, the enlarged meeting of the WPK CC Politburo decided to establish the State Physical Culture and Sports Guidance Commission to spearhead the development of North Korea into a sports power, appointing Jang as its inaugural chairman. This may have been the beginning of his demise. Although sports can bring quick popularity, earn foreign exchange, raise patriotic fever, and help burn the energies of the youth and distract the masses from their daily hardships, it can never beat national security and socio-economic development in terms of its political significance. By asking Jang to chair the National Sports Commission, the young North Korean leader, less than a year into power, might have begun to nudge his uncle out of important policy deliberations. Second, in January 2013, Jang, vice-chairman of the National Defense Commission, was not invited to the meeting of top officials handling security and foreign affairs—viewed as the North’s equivalent of the US National Security Council—in which Kim Jong Un made “an important decision to take substantial and high-profile important state measures” after discussing the impact of new UN sanctions imposed on Pyongyang for the December 2012 rocket launch. Jang’s glaring absence signaled the emergence of a possible crack in the senior leadership, especially in the relationship between Kim and his all-powerful uncle, raising the possibility of divergent approaches between Kim and Jang to the North’s foreign policy strategy, especially on the issue of conducting a nuclear test and ways to cope with sanctions. Third, when Choe Ryong Hae, vice-chairman of Central Military Commission (CMC) and Director of the KPA General Political Department, visited China as Kim’s special envoy in late May 2013, it was striking that Kim had chosen Choe, not his uncle, as his first special envoy overseas. In hindsight, it appears that as the perceived “China man in Pyongyang,” Jang may have been foregone by Kim Jong Un, who may have wanted to send a strong signal to China on the controversial issue of escalation of nuclear tensions and DPRK nuclear deterrence, because of Jang’s known partiality with respect to China and his interest in preserving his own good standing in Beijing. His perceived close ties with China may have done a disservice to his standing in the eyes of Kim, exposed him to criticism of being too subservient to China, and made him vulnerable to any anti-China backlash in Pyongyang. On December 8, the Politburo said: “Jang pretended to uphold the party and leader but was engrossed in such factional acts as dreaming different dreams and involving himself in double-dealing behind the scene.” What must have been particularly unsettling to Kim Jong Un was Jang’s continued expression of sympathy towards Kim Jong Il’s eldest son Kim Jong Nam, who is hiding in exile under the protection of Chinese government. Four alternative hypotheses emerged to explain Jang’s downfall: 1) Jang’s attempt to form his own center of power and challenge Kim Jong Un; 2) a power struggle between two regents (Jang and Choe); 3) policy disagreements within the top leadership on such principal issues as the main party line on parallel economic construction and nuclear development (the “byungjin line”); and 4) Kim Kyong Hui’s decision to punish or get rid of Jang. Several analysts speculate that co-regent Vice-Marshal Choe Ryong Hae has been the driving force in eliminating Jang, and his ousting may be the culmination of a war of regents that has been raging in Pyongyang ever since they joined together to remove Kim’s foremost guardian—Vice-Marshal Ri Yong Ho in July 2012. From this perspective, Jang lost out in a power struggle with Choe, who was able to persuade the military that Jang was their enemy number one who arbitrarily prosecuted their colleagues. 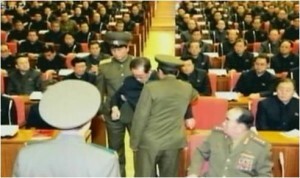 It is noteworthy that the photo of Jang’s arrest released by North Korea prominently features the former Chief of General Staff General Kim Kyong Sik, who was rumored to have been one of the victims of Jang-instigated purge last August; he looks with approval, ready to help the guards to restrain Jang. It has been evident that Jang and Choe did not like each other and sought to develop personal followings, build their own power bases and support networks at the expense of one another. For instance, Jang made a significant bridgehead within the military as approximately 200,000 troops fell under the control of the WPK CC Administration Department he headed. Both sought to accumulate independent financial resources to buy loyalties and promote their own policy priorities, while scheming against each other until Choe prevailed. 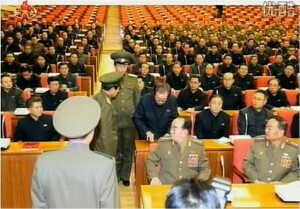 If the North Korean military was convinced that it was Jang who orchestrated ceaseless purges within the KPA over the past two years as the guy in charge of North Korean gulag, it was probably relatively easy for Choe to get the KPA top brass onboard behind his campaign to undermine and oust Jang. This is how, after the death of Stalin, the then-Soviet collective leadership was able to remove his notorious henchman Beria from power in December 1953. The Politburo accused Jang and his group of weakening the party’s guidance over judicial, prosecution and people’s security bodies, which brought “very harmful consequences” to the work for protecting the social system, policies and people. Jang’s departure from the political scene may turn out to be a double-edged sword for his chief political opponent. On the one hand, Jang’s disappearance will clear the space for Choe to expand his own political influence, especially in the power bloc previously controlled by Jang. But, on the other hand, it may also expose Choe to accusations and suspicions that he is harboring his own ambitions for supreme power and may make Kim Jong Un increasingly uneasy about Choe’s growing political influence. Some ROK analysts have attributed Jang’s disappearance to his deepening policy disagreements with Kim Jong Un and other senior officials, especially in the Politburo and the Cabinet. They assert that Jang advocated a forceful push for a broad and deep Chinese-style economic reform and wide opening, while moderating the country’s nuclear and space ambitions. This position put him at odds with Kim Jong Un’s “byungjin line” and traditionalist hardliners seeking to limit any reform while prioritizing a strong defense. 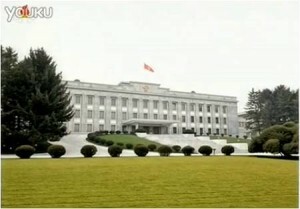 Of particular concern to the new leadership, which chose to emphasize Kim Jong Il-style patriotism and the DPRK’s unique national identity, must have been Jang’s insistence on further expanding relations with Beijing—to placate and embrace China, to live the “China dream” and emulate everything Chinese—as well as his intimate connections in Beijing, which were beyond Kim Jong Un’s reach. According to North Korean defectors in Seoul, “the North Korean people see Jang as the economically savvy manager who knows a lot about China; and for Kim Jong Un, the fact that people view Jang this way must have been fairly unsettling.” By removing Jang, Kim Jong Un eliminated a possible rival who could have become a popular elderly leader riding the wave of Chinese-style economic liberalization one day. In the short term, one can expect greater uncertainty as to the future of economic reform. Some analysts regard Jang as “a reformer” and now expect considerable backtracking on economic reform measures or, at the very least, a certain deceleration of the pace of changes promoted by the North Korean government. Alternatively, others regard Jang as a proponent of cautious “half measures” and a stumbling block in the way of genuine reforms and consider his dismissal as a very big step in taking the power away from the old guard inherited from Kim Jong Il’s era. They argue that it might help Kim Jong Un unleash new political forces advocating much more ambitious reforms, which could be really transformational in nature and produce “quite literally a Deng Xiaoping like moment” in North Korea in the next 1-2 years. Ultimately, whoever will fill the power vacuum left by Jang—more ardent advocates of reform and change or more staunch defenders of the status-quo ante—will tell us who exactly won the current round of power struggle in Pyongyang, the future of economic reforms, and how stable the Kim regime may be in the future. Finally, Jang’s relationship with his wife Kim Kyong Hui, who was reportedly the executor of her brother Kim Jong Il’s last wishes, was traditionally tense, despite the fact that he derived his status and power primarily from his marriage. As her health deteriorated throughout the year, she was reportedly less and less inclined to put up with his shenanigans or to defend him against his critics. Some people say Jang’s ouster may be temporary and he could return to power soon, citing his previous comebacks. Yes, indeed, quick-witted and politically ambitious Jang is a survivor, and he did come back several times before. But, I believe he will not come back this time. The Politburo indictment of “Jang and his faction” is so unprecedented in its severity and its open and scathing repudiation of Jang that it probably means that he is gone forever, and that Kim Kyong Hui either acquiesced to it or could not do anything to stop Kim Jong Un. In the past, Kim Jong Il loved his sister (Jang’s wife) and did anything to please her; so when she asked him to teach a lesson to her philandering and arrogant husband, Kim Jong Il restrained or demoted him, then forgave Jang because she pleaded with her brother to bring him back from exile. Now, it is Kim Jong Un’s reign. He probably believes that he owes nothing to his aunt and uncle-in-law. Moreover, Kim probably wants to get out of their shadow as soon as possible, like any other 30-year old man. Under present circumstances, such a dramatic and irreversible downfall of Jang Song Thaek means that Kim Kyong Hui probably exhausted her patience with Jang for whatever reason and decided to sever their tortuous relationship at last. By eliminating Jang, Kim Jong Un has proven that he reigns supreme and is a formidable presence to be discounted only at one’s own peril. He knows his way around the dog eat dog world of North Korea, and will not hesitate to dance on his rival’s grave. In short, Kim is demonstrating swift ruthlessness in eliminating his potential enemies inside the royal palace and military barracks. Clearly, Kim Jong Un outwitted Jang, who must have known very well what could happen to the mentor of supreme leader when his apprentice outgrows him, and, therefore, schemed tirelessly to secure his long-term position, but to no avail. By dumping Jang, Kim Jong Un dismissed or demoted five (U Dong Chuk, Ri Yong Ho, Kim Jong Gak, Kim Yong Chun, and Jang Song Thaek) out of seven guardians appointed by Kim Jong Il to help him solidify his grip on power. Only party secretaries Kim Ki Nam (87) and Choe Thae Bok (83) are still standing, though probably not for long, given their very advanced age; however, they really are no longer part of Kim Jong Un’s inner circle. This trend suggests that Kim feels increasingly self-confident and is no longer willing to delegate his authority to his presumed patrons. The purge of Jang Song Thaek and his faction reflects Kim Jong Un’s recognition of the threat of factionalism and the importance of nipping it in the bud before it got out of hand. It may also indicate that Kim Jong Un is having doubts about relying on his family members to rule. Instead, he seems to prefer to rely on the descendants of other revolutionary families, who can be controlled and manipulated without hesitation and doubt. Kim may feel that he no longer needs the issue-area policy czars and can now make major policy decisions on his own. Jang’s purge, far from undermining the stability of the regime, may open a period of cleansing with big and small purges as well as loyalty competitions among the elites, further cementing Kim’s firm grip on absolute power and establishing him as the “sole center of unity” and “unified leadership system” in the DPRK. The war of regents may be over, but it is a Pyrrhic victory for Choe Ryong Hae, because Kim Jong Un is no longer inclined to allow others to concentrate power in their hands at his expense, especially as far as the number two person is concerned. Hence, Choe beware, you may be next! Kim keeps biting the hand that feeds him. Finally, to avoid a similar fate, Kim Jong Un must outwit and outplay his enemies, by being more ruthless and determined than all of them combined. In other words, Kim “the Charmer” must become Kim “the Decider” like his father was and follow Kim Jong Il’s playbook, if he wants to survive the increasingly rough waters of North Korean politics. 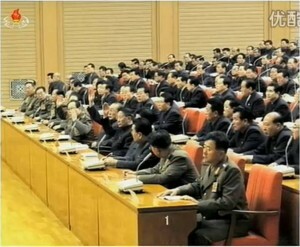 Front row from left to right: Kim Yong Nam, Kim Jong Un, Choe Ryong Hae, and SSD Director Kim Won Hong. 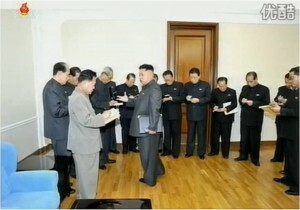 Kim Jong Un gives instructions to the Politburo Members after the enlarged meeting of the Politburo, on December 8, 2013. 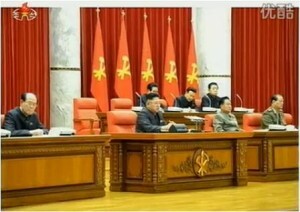 From left to right: Choe Ryong Hae, Kim Yong Nam, Pak Pong Ju, Kim Ki Nam, Choe Tae Pok, Pak To Chu’un, Kim Yong Il, Kim Yang Gon, Ro Du Chol, Cho Yon Chun, Kwak Pom Ki, Mun Kyong Dok, Tae Chong Su. Kim Kyong Hui is conspicuously absent. Alexandre Mansourov, “Part I: A Dynamically Stable Regime,” 38 North, December 17, 2012, https://www.38north.org/2012/12/amansourov121712/. Jang’s posts included Vice-Chairman of National Defense Commission, Member of WPK CC Politburo and WPK Central Military Commission, Director of WPK CC Administrative Department, KPA General, Chairman of National Sports Commission, Deputy of Supreme People’s Assembly, and Chairman of the DPRK Side Committee of the DPRK-China Joint Guidance Committee for the Joint Development and Management of the Rason Economic and Trade Zone and Hwanggumphyong and Wihwa Islands Economic Zone. Report on Enlarged Meeting of Political Bureau of Central Committee of WPK, KCNA, December 9, 2013. It was KPA Defense Security Commander Cho Kyong Chol and his DSC troops that detained the former Chief of KPA General Staff Ri Yong Ho when he was purged in July 2012. “Clearer Picture of Jang Song-taek’s Ouster Emerges,” Chosun Ilbo, December 5, 2013. For the first time since the 1970s, North Korea has released the footage of the arrest of a senior official on the spot. “N. Korean leader’s uncle deleted from state media website,” Yonhap, December 8, 2013, http://www.globalpost.com/dispatch/news/yonhap-news-agency/131208/n-korean-leaders-uncle-deleted-state-media-website. “TV footage further hints at purge of N. Korean leader’s uncle,” Yonhap, December 7, 2013, http://english.yonhapnews.co.kr/national/2013/12/07/60/0301000000AEN20131207002051315F.html. Jang had made far fewer appearances accompanying his nephew this year than in 2012, an indication that he may have been losing his influence for some time. According to ROK unification minister Ryoo Kil Jae, even before the supposed purge, Jang’s public appearances have decreased from 106 in 2012 to 52 this year. “N. Korean leader’s uncle not personally affected by dismissal: policymaker,” Yonhap, December 4, 2013, http://english.yonhapnews.co.kr/national/2013/12/04/92/0301000000AEN20131204008400315F.html. Ironically, in his last known public appearance Jang was characterized only as Chairman of Sports Commission (with all other official titles dropped) when the government-controlled media described his meetings with the visiting Japanese delegation led by Kanji Inoki, a Japanese lawmaker, in November 2013. Source: “장성택 국가체육지도위원회 위원장이 일본국회 참의원의원일행과 일본체육대학대표단 주요성원들을 만났다,” Rodong Sinmun, November 7, 2013, http://www.rodong.rep.kp/ko/index.php?strPageID=SF01_02_01&newsID=2013-11-07-0014&chAction=S. “Absence of N.K. leader’s uncle sparks speculation over internal power game,” Yonhap, Lee Chi-dong, January 28, 2013, http://english.yonhapnews.co.kr/national/2013/01/27/80/0301000000AEN20130127006000315F.HTML. It is important to remember that although Jang Song Thaek visited China in August 2012, he did not go there as Kim’s special envoy. “North Korean leader’s uncle likely removed from power: spy agency,” Yonhap, December 3, 2013, http://english.yonhapnews.co.kr/northkorea/2013/12/03/5/0401000000AEN20131203008552315F.html. “Bloody Purge Targets Jang Song-taek’s Cronies,” Chosun Ilbo, December 5, 2013, http://english.chosun.com/site/data/html_dir/2013/12/05/2013120501132.html. These included Jang’s brother-in-law, DPRK Ambassador to Cuba, Jon Yong Jin, the wife and two 20-something sons of Jang Yong Chol, the DPRK ambassador to Malaysia and Jang’s nephew. “Relatives of N. Korean leader’s deposed uncle return home,” Yonhap, December 5, 2013, http://english.yonhapnews.co.kr/northkorea/2013/12/05/53/0401000000AEN20131205008100315F.html. 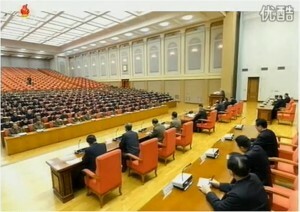 “Fear Arrives as Top Cadres Recalled,” Daily NK, December 6, 2013, http://www.dailynk.com/english/read.php?cataId=nk01500&num=11244. For instance, Jang allegedly objected to the use of state funds for the construction of some of the leisure facilities approved by Kim Jong Un and questioned the need to build new revolutionary monuments, revolutionary sites, and mosaics glorifying Kim Jong Il. He was also allegedly opposed to Kim’s decision to suspend the operations of Kaesong Industrial Complex last April. “Defector Claims Jang-Choi in Military Battle,” Daily NK, July 5, 2013, http://www.dailynk.com/english/read.php?cataId=nk00400&num=10708. In contrast to Choe, Jang failed to launch his own high-profile on-the-spot inspections, thereby missing a unique opportunity to become a complimentary face of the North Korean regime for the general public. In May, Kim sent Choe, not Jang, as his personal envoy to Beijing to hand-deliver a letter to President Xi Jinping. “Jang’s Economic Policy Hangover,” Daily NK, December 4, 2013, http://www.dailynk.com/english/read.php?cataId=nk01500&num=11235. It is interesting that after Stalin’s death, Beria, too, positioned himself as an economic reformer and advocate of engagement with Western Europe, which his opponents deemed as a treason and threat to the Soviet-style socialism and Soviet national security and identity. By the same token, by purging the “China man in Pyongyang,” Kim Jong Un, in the eyes of Pyongyang’s conservative elites, ostensibly, saved North Korea’s authentic socialism from the peril of Sinification and removed the threat of China’s complete takeover from the North Korean economy, politics, and society. “Dismissal of Kim Jong-un’s uncle to trigger big change in regime,” Yonhap, December 3, 2013, http://www.globalpost.com/dispatch/news/yonhap-news-agency/131203/news-focus-dismissal-kim-jong-uns-uncle-trigger-big-change-r.
 “Kim Jong-Un dismisses powerbroker uncle as North Korea inches toward reform,” The Globe and Mail, December 3, 2013, http://www.theglobeandmail.com/news/world/north-korean-leaders-uncle-believed-dismissed-from-posts-south-korean-lawmaker/article15734116/. “Signs of N. Korean Purge Spotted in September,” Chosun Ilbo, December 4, 2013, http://english.chosun.com/site/data/html_dir/2013/12/04/2013120401183.html.